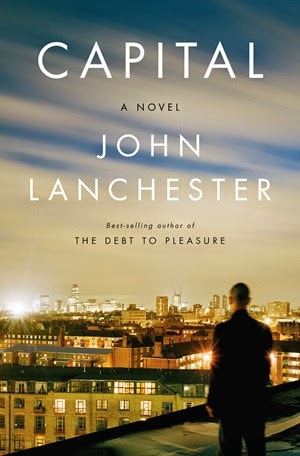 With a title like Capital, set in 2007 and 2008 in London, one might expect this book to be primarily about the financial crash. Though this certainly impacts the narrative, it is more about how those living in a posh neighborhood orient their lives towards or away from materialism. The binding thread between these neighbors is that someone along Pepys Road is leaving cryptic notes that say, "We Want What You Have." Though the sender of these notes is a mystery to be solved, this mystery is a back drop to depictions of the neighbors' lives rather than a propelling force. The two main characters who come to exemplify the opposing forces of materialism are Roger, an investment banker, and Usman, a Muslim who runs a family-operated shop. Roger's wife, Arabella is a "breadhead," a never-reformed addict to spending money. This becomes a problem when Roger doesn't get his expected bonus at Christmas time. Usman is a surly critic of Western decadence who covers the shop's alcohol with a blind and lurks on angry Jihadist websites. Both of these extremes end up working poorly for these characters. The plot is not overarching, but rather follows many characters through a single distinct event in their lives. Smitty, a graffitti artist who depends on his anonymity for success, sees that anonymity threatened. Quentina, a parking officer who is working as an illegal immigrant, is threatened to be deported back to Zimbabwe where she would most likely be killed. A Polish painter, Zbigniew, struggles to decide what to do with a suitcase of money he found hidden while on the job. And a young football (soccer) player, Freddy is doing famously until he gets injured. The book is artfully structured so that each time I wanted to know a little bit more about the particular character it was focused on, the author would dwell a little longer on him or her. The world of each character is believable, though the tone is remarkably consistent for how many different perspectives the book encompassed. Despite the trajectory for each character being so distinct, the book is remarkably cohesive and has enough cross-over from character to character that it does not feel like a mere collection of stories. I enjoyed reading a fictional work that was set in such a contemporaneous time. The main value of the book is to capture the current unrest of so many of our lives in a fictional portrayal of vastly different lives. An added bonus, as an American reader, was the frequent use of British slang such as "wonkers," "pottering" and "rubbish" and other more colorful phrases. The drink I would choose to accompany this is an out-of-date "fizzy pop," the British slang for soda. This is appropriate because many of the characters' lifestyles fizzle with the economic downturn. The reason it ought to be out-of-date has to do with the money Zbigniew found. I'll add this to my Goodreads "to read" shelf. I enjoy reading what YOU write!